Delicious chocolate covered sunflower kernels all wrapped inside of a stack of moist buttermilk pancakes. A drizzle of warm chocolate ganache over these fluffy Sunbursts Pancakes, makes for a perfect breakfast OR dessert! Ready for a fun breakfast?! As you know with me, I even dream of sweets! And, a sweet breakfast is just my type. I even like to sweeten up the classic French Toast… Today, I’m sweetening up some buttermilk pancakes! A stack of these Sunbursts Pancakes with Chocolate Ganache poured all over will definitely satisfy your hungry belly AND your sweet tooth! Whether you have these for breakfast OR later for dessert! We make buttermilk pancakes here on a weekly basis. At times, it’s banana or peanut butter pancakes. Other times, we go crazy and make them with candy! These little Sunbursts candies are filled with sunflower seeds and then wrapped in chocolate. How much better does that get?! They have that delicious crunch in the center. Even if you’re not a sunflower seed lover… you will be with these! Having these candies inside of a warm buttermilk pancake is simply the best! This drizzle action with the chocolate ganache… the whipped cream… and more Sunbursts, all needs to be on your sweet list. Delicious chocolate covered sunflower kernels all wrapped inside of a stack of moist buttermilk pancakes. A drizzle of warm chocolate ganache over these Sunbursts Pancakes, makes for a perfect breakfast OR dessert! 1/4 cup Sunbursts candy, add more for garnishing, optional. 2 tablespoons unsalted butter, for heated griddle. In a large mixing bowl, whisk together flour, sugar, baking powder, baking soda, and salt. Set aside. Beat the egg into the buttermilk with the vanilla in a separate bowl or in the liquid measuring cup. Add the wet ingredients into the dry ingredients. Gently stir in the candy with a spoon until all of flour is covered. Do not over mix. Lumpy is GOOD and the batter is more on the thick side. Drop about 1/4 cup (per pancake) on the heated surface for about 2 minutes. Flip pancakes when you see air bubbles and dry on the edges. Cook on the other side for additional 2 minutes. Scald heavy whipping cream in a pan or microwavable bowl. Whisk in the butter, chocolate chips, and vanilla until all chocolate has melted. Set aside to cool. The longer it cools, the thicker it becomes. Pour over warm pancakes and top with more candy and whipped cream. Enjoy! Makes 6 medium sized pancakes. Pancakes and ganache may easily be doubled. May individually freeze each pancake for up to 4 weeks. Refrigerate ganache in a covered container for up to a week. What is your favorite kind of breakfast? Gloria, love the pancake remix 😀 I have never had sunbursts! Sad I know!! Totally going to buy these when i’m at the store next. Buttermilk in pancakes, definitely is that ingredient that makes them taste like a country breakfast. Perfection. I haven’t made buttermilk pancakes in forever. Pinning this! Thanks for sharing 🙂 Happy St. Pattys! Oh wow, Gloria!! How delicious, my kids would love this one! I also posted today a recipe using fudge, check out my Hot Fudge Cake! Michael, your kids would definitely love these! Heading over to check out your cake… can’t pass that up! These look perfect for a birthday breakfast! 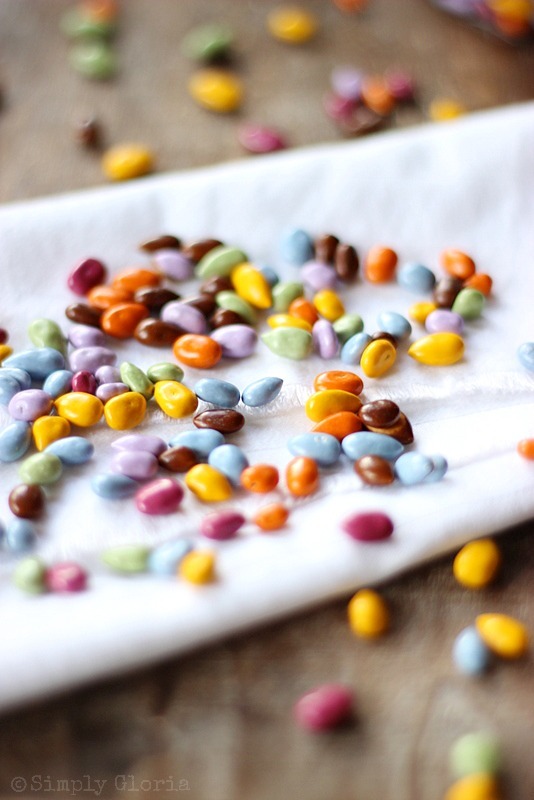 I always see those chocolate-covered sunflower seeds at TJs and am so intrigued to try – I think I’ll give them a go now! Julia, these little candies are really fun! (I love the colors, the best!) Hope you’re enjoying your Tuesday! I’m so with you on sweet breakfasts. I mean, I love eggs and all, but sweets for breakfast is def the way to go. 😉 I’m literally drooling over your gorgeous pictures. 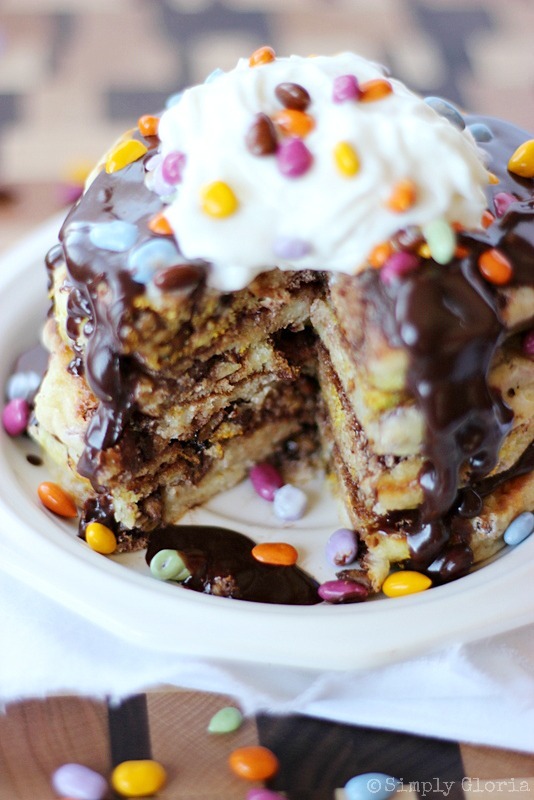 Any kind of pancakes that are smothered in chocolate definitely grabs my attention. pinned! Oh my! These look amazing! These look like such a treat. I have a pound of these bright little sunflower seeds I got from Nuts.com for $6.99 a pound and I was wondering what the heck to do with them. My taste buds thank you. My hips, not so much. Maralyn, you are too funny! My boys devour these little candies so fast, that I had to hide them to put them in these pancakes. Super fun to make things with! I am always ready for breakfast :). I can’t think of anyone who wouldn’t love a tall stack of these pancakes. They look beyond perfect. Cannot wait to get my hands on those starbursts – they are so adorable and I am loving all the colors!!! Thanks, Kathi! The colors are really fun! I like to sweeten up life from early morning too. These are gorgeous pancakes Gloria and a little sinful! 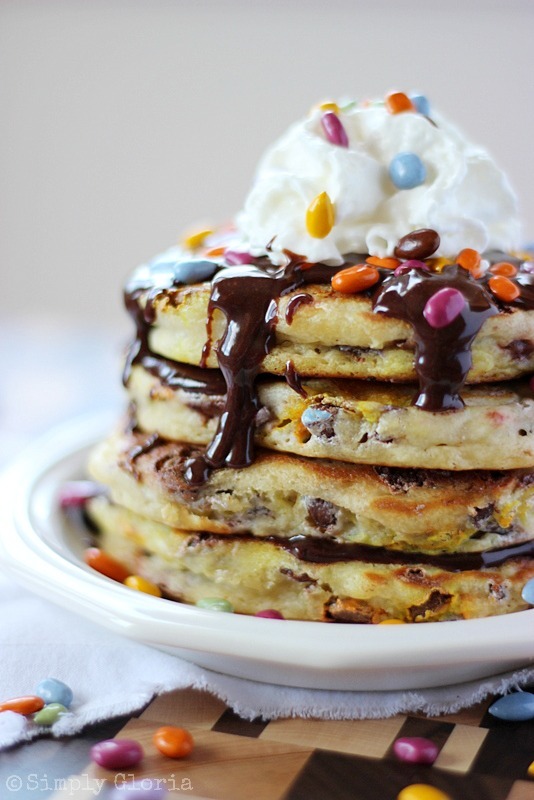 How is it that I never thought to put candy in our pancakes! The possibilities are endless! These look jaw dropping good! Nancy, your kids would love these fun pancakes! Soo… if we lived near each other Cason and I would totally be at your house every morning for breakfast!!! Seriously girl, love this. Can totally see myself making these for Cason birthday breakfast, how fun and colorful. Just a party on a plate. Pinned! I AM so enjoying this Gloria! I can’t wait for Emily to get bigger so I can make something this yummy for her! Pinning!! These just look amazing! How do you get them to be so fluffy? My pancakes always spread. 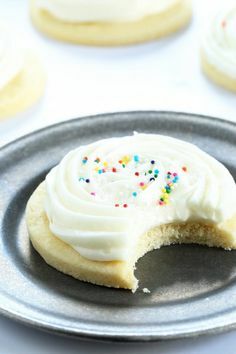 These look so fluffy good! Although, I’m still drooling over your French toast! Kelly recently posted…Two – Start a crochet notebook, journal, scrapbook, or blog. Kelly, I love how your daughter was in love at first glance! This is like my childhood dream!! So fluffy! Thanks so much, Nicole! Fluffy pancakes are the best! Gloria, now THIS looks like a great way to jump start the morning! These look fantastic! Pinning! Hope you have a happy and wonderful day! I see children’s birthday breakfast banner blazing across right now. I’m sure my daughter would be all over these! Delightful to look at! What a great idea, Melanie! Birthday breakfasts are the best! Oh. My. Gosh. These look AMAZING! And since the Sunbursts contain sunflower seeds, it’s basically healthy, right? Right? 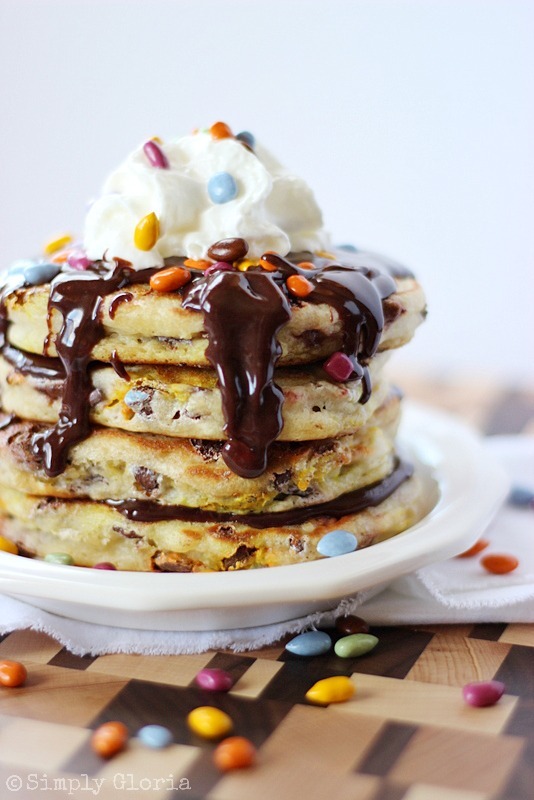 Well maybe not, but I am drooling over these pancakes… Easter morning breakfast, perhaps! Sam, that’s how I justify things… lol! These pancakes are so fun!! I’d love for you to come share at Simple Supper Tuesday. Cindy, thanks for the invite! These are gorgeous! Almost to pretty to eat! I love how colorful they are and I’ll bet they taste great too! Tina, you just made me seriously laugh out loud! I’m the same way! 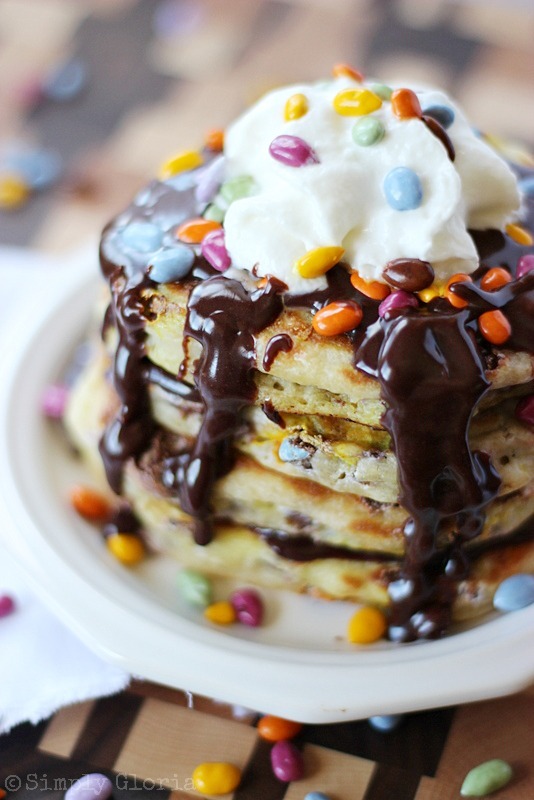 Such gorgeous colorful pancakes! I love them! These pancakes are so much fun, Gloria!! When we owned a restaurant, we had a little vintage sign that read “life is too short, eat dessert first!” This is definitely the perfect way to eat dessert first!! Now that’s my kind of breakfast! I have never heard of Sunbursts before, I live a sheltered life. 😉 They look so delicious Gloria, I wish I could dig in right now!! Lisa, I’m right there with you. When Kimmie Candy sent me these little candies… my boys were already saying how they love them. I have never seen them before. So, I guess we both live sheltered lives…lol! Holy goodness! Those look amazing. I’m going to have to try that out. Hi, found you at Chef In Training blog. I want to invite you to my Cunning Ladies’ Friday Party. The theme is My Popular Post. Please join us. 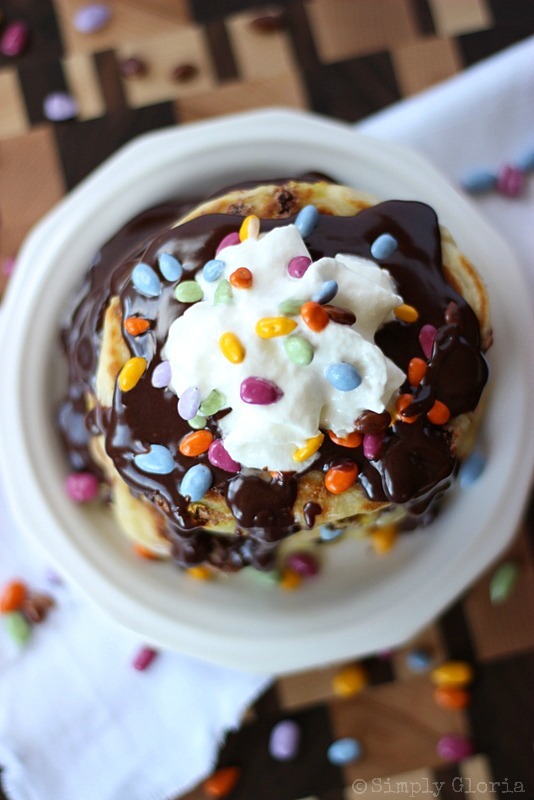 These look sooo good, I love the idea of pouring ganache over pancakes!! Pinned! Wow, these are just too gorgeous!!! I love all your photos, Gloria! Pinned! Hi – back again! Featuring these tonight at MM… they are so good! These would be perfect for Easter breakfast or brunch… YUM! Thanks for sharing this recipe at my Facebook Milestone Link Party :)! Keep up the great work! You recognize, many persons are hunting round for this info, you can help them greatly.